These refrigerators feature white steel door panels‚ rustproof shelving‚ and gasketed magnetic doors. Model 3751-DB (stock # 28250) is an under-counter refrigerator with a reversible door. This 2-shelf manual defrost unit is perfect for use as an economical BOD incubator alternative with our BOD refrigerator converter (stock # 63390)‚ which provides thermostatically controlled constant temperature heating and/or refrigeration as required. 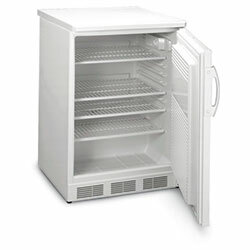 Model 3766A (stock # 28252) is a‚ 5-shelf manual defrost unit with 26 ft2 of shelf area and a storage basket. Door is not reversible. Includes lock and key. Internal dimensions are 27"W x 57"H x 17-3/4"D. 120 VAC. 1-year warranty.